Blown away is the only terms I could describe what I saw when a new customer signed up with Barefoot Pool Service. She was paying a premium price for pool service last Year. This was the first thing I noticed this hot tub that was supposed to be winterized was not. Good thing we did not have a cold winter. 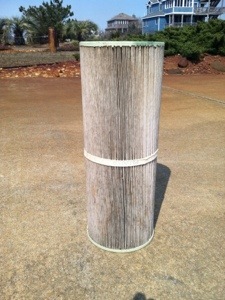 Here is the condition of how the hot tub filter was stored. Just throw it out!Why would you let that sit all winter like that? Soak it and clean the filter. Then throw it in the hot tub to be stores for the winter. We see this all the time pool people that just don’t care. They are either payed to low or they are being over worked and they just don’t have time to do the job correctly. It’s a shame because it is the home owner that suffers because they have to pay twice to get the repair done right when it should have been done correctly the first time. This is a small example of what is waiting for me when we start getting there pool and spa open and running the proper way with repairs done right and pool water chemistry right on the money. Giving you and your guests the pool service that you deserve at the right price. 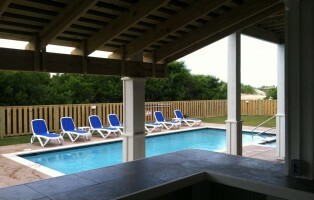 Barefoot Pool Service is centrally located on the Outer Banks North Carolina in Southern Shores. Call us today for your free pool equipment assessment and problem solving your pool and spa troubles. Call 252-564-9888 we look forward to helping you.